Cystic fibrosis is an inherited genetic condition. Both parents must carry a mutation in one of the two copies of the gene that causes cystic fibrosis (the CFTR gene) and each parent must pass the mutation on to their child. If a child receives two copies of the faulty gene – one from each parent – he or she will develop cystic fibrosis. Cystic fibrosis is a serious illness that severely affects day-to-day living. Not all people are affected in the same way; however, common symptoms include thick mucus build up in the lungs and difficulties breathing. Mucus and protein also accumulate in the digestive tract, making it difficult to digest and absorb nutrients from food. Though cystic fibrosis affects both children and adults, most are diagnosed as infants. Some Facts About Cystic Fibrosis• One in every 3,600 children born in Canada has cystic fibrosis. • 50% are diagnosed by 6 months of age, and 73% by the age of 2 years. • The median age of people living with cystic fibrosis is 20 years. About 43% of people living with cystic fibrosis are 18 or younger. • In 2011 there were 114 people diagnosed with cystic fibrosis. • Children with cystic fibrosis used to die very young. Now, on average, people with this disorder live into their thirties and forties. 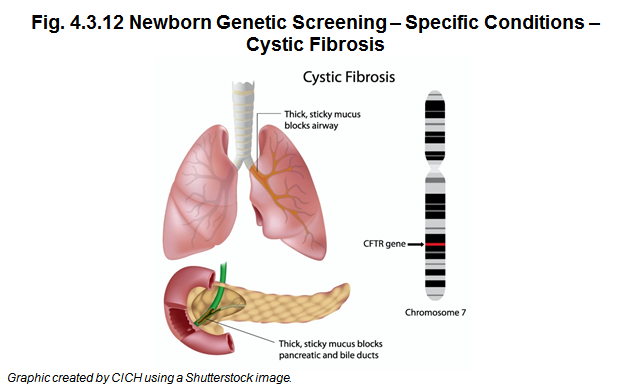 • Newborn screening for cystic fibrosis can help to improve the outcomes for those diagnosed with the condition, including reduced hospitalizations and a longer life expectancy.